Just before I left Australia, there was a bit of controversy over Dominique Rizzo and her endorsement of Gourmet Garden pre-prepared herbs in tubes. Dominque is known for her use of fresh, organic produce so there were some question raised about the product she was endorsing – was she selling out? Now whilst Domnique may bill herself as a celebrity chef, it would be safe to say that she’s not yet in the league of Nigella or Gordon as far as public profile so perhaps the endorsement raised her profile rather than diminishing her reputation. 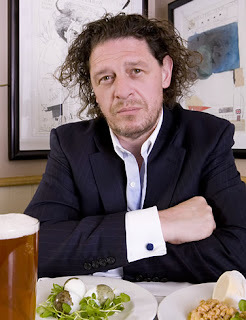 Marco Pierre White on the other hand can hold his own in the celebrity chef stakes. The three Michelin starred chef is known as the’ enfant terrible’, a reputation he happily maintains. He has a huge empire with at least 5 restaurants under his name, a deal with Russell Hobbs cookware and appliances, cookbooks galore and the host of Hell’s Kitchen. Imagine my surprise then, when I watching the TV last night and who should come on but Marco, advertising Knorr Stock Reductions. “You would be mad to make stock from scratch for large banqueting occasions when you have Knorr Stock Reduction”, says Marco. I’m sure if I trawled through Marco’s books, he’d no doubt emphasise fresh products and making things from scratch. I bet he gives those wannabe chefs a roasting when they are creating the stock pot in Hell’s Kitchen. There’s nothing wrong with powdered or liquid stock but it’s certainly not going to get you a Michelin star. But, it appears that even Marco has a (3 Michelin starred) price. I think ‘You’d be mad to endorse a product that’s going to throw your integrity into question’. It’s a funny old world.